I promise to use it only to send you Creative Writing News and Tips. Our Legends of Druidawn Game System is no longer a product for others to purchase. Instead, it is a service that our company offers online to students all over the world who need creative writing motivation. Children ages 7-18 can join our exciting creative writing clubs from the comfort of their own homes at a time that is convenient for their schedules for just $15.00 a session! Email us directly for details on how your child can join a group. Here's a little history on this product. Legends of Druidawn inspires reluctant children to get words onto paper like nothing else on the market. 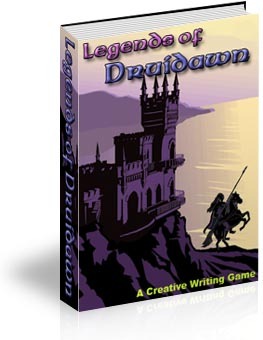 It works as a great centerpiece to our creative writing clubs, and it has a companion book, Druidawn Volume 1 and a website, both of which allow us to expand on the opportunities we offer to our students. This game is the product of years of trial and error in an attempt to get resistant boys to write. I say "boys" because the girls have always been much easier. For several years, I directed creative writing clubs on the weekends for girls only. These clubs filled quickly to maximum capacity and the girls wrote willingly, happily. They were there to express themselves and it didn't seem to matter to them if they did this by speaking or by writing. Both ways were enjoyable. I didn't need to coax them with prizes or games. They came to writing club every week ready and willing to write. I thought I had a good thing going by offering this simple service, until a couple of parents asked me if I could start a club for boys. I foolishly agreed, thinking I could teach the boys the same way I taught the girls. I gave the group a cool name, Dragon Writers, and had all kinds of fun writing assignments planned. The first five sessions, comprised of four boys ages 8-11, were a complete disaster. They didn't want to write! I tried everything to get them interested in writing, but nothing worked. Though they were reputed to be talented writers at school, they came to my clubs every week and moaned about having to pick up their pencils. Their heads became too heavy to lift off of their papers. They checked the clock every few minutes, sighed, then stared longingly out the window and sighed some more. I was baffled. I tried offering them prizes for writing, which perked them up a little bit, but it had no carryover effect from one writing class to the next. And the class size stayed terribly small for several months. Their friends didn't want to join. Their friends were home playing video games and having imaginary battles outside. I almost called it quits. I just couldn't teach boys how to enjoy the art of writing. Written communication didn't seem to come naturally to them. They could perform well when required to do so in school, but exercising this skill in their free time certainly wasn't their idea of fun. It was obvious that what they wanted, or perhaps needed, to do was play. I had to figure out a way to turn writing into a game, or give up permanently on motivating boys to write. I wracked my brains for weeks until the idea finally came to me. I had to look closer at what they liked to do in their free time, and somehow turn that into writing. I watched my own sons play adventure quest games for hours on end, on their computer and their television, observing how enraptured they were with the interactive role-playing games, and a new concept sprang into motion in my mind. I already had the Druidawn anthology almost completed by my older students, and it was a short conceptual leap from a fantasy novel written by aspiring teen authors to an interactive questing game based on this book. Drawing from my own experiences of playing such exciting games in my youth, I realized that it couldn't be terribly hard to make up one of my own. Without having a solid plan in place, I came to the next boys' club meeting prepared to take my boys to Druidawn through their imaginations. I had them fill out character sheets, which I had made up the week before, and I pulled out the map so they would have something exciting and colorful to look at. Then I placed their characters somewhere on the map and I gave them a situation. They were adventurers and they had to rescue a royal family that had been captured and was being held in the high tower of the evil overlord Vanderis' palace. I gave them the setting, the task, and mentioned the reward they would receive if they accomplished the goal (of course a healthy treasure for their characters). The adventurers eagerly set off. The first thing they encountered was a giant troll guarding the castle gate. They had to outsmart the troll before they could continue on. The boys were hooked. They came back the next week, with friends in tow, not only ready to play the game, but eager to write about the adventure as they went along. A club of four boys turned into a club of 24 boys (along with a waiting list) in a matter of months - with absolutely no advertising on my part! They became so excited about the game that they were willing to write at home in their free time just to get extra points for their characters. I designed the game so that they would have to write six pages of quality narrative in order to move up a level (when you move up a level, you get more energy points, more imaginary money to spend on your character, and more attribute points). They were coming to me with over 10 pages of narrative a week just to gain levels in the game! It was certainly the cheapest reward I could offer. Ever since, parents have consistently asked me in amazement what magic I have to make their children write. Well, now everyone can create the magic. Oh, and by the way, girls like it too! This game is rather complicated to learn but children tend to pick up the rules faster than adults do. Legends of Druidawn is designed to relate to kids on their level, using terms and conditions they are quite familiar with (from playing questing games on the computer, or Nintendo, or role playing games with their friends). Legends of Druidawn can be played with anywhere from one to five players who join us from separate computers from their own homes. Due to the verbal nature of this game, and the length of time involved in each turn, it is not recommended for groups larger than five at one time. This is from a parent whose son enrolled in one of my writing clubs where I play Legends of Druidawn (there's no reason this can't be you). What can I say but an enormous thank you!!! Your writing club has turned my 12 year old son Seann into a reader and a writer. I can't believe the transformation. As you know, Seann's dyslexia was really keeping him from a world he loved - the world of fantasy fiction. His only entry into this realm was waiting for others to have the time to sit down and read to him, as his level of reading skill didn't allow him access. Then, he would have to work on his "reader" to turn an hour reading session into 3-4 hours. January 2003 he enrolled in your Dragon Writers after school program. The combination of writing to gain skill levels for his invented character, the interactive role playing games and the suggested reading materials did the trick - within months he was reading well enough to pick up most fantasy fiction books and read them on his own. But it didn't stop there. His reading and comprehension was equally improved in other school-related reading and his writing skills have been unleashed. He is currently working on his own fantasy fiction novel and it is quite good. I could go on for pages. You and your program have changed Seann's life (and mine as well - as his main "reader"). You have bestowed a gift that is beyond compare and priceless. Thank you from the very depths of my heart. We will both remember your gifted teaching skills and your unique curriculm forever. I hope that your program will reach as many children as possible because I am certain that there are others who would benefit too. Online creative writing clubs generally run 75-90 minutes once a week or twice a month and include share time, writing prompts, leveling up characters, and writing motivation game play. Why not give Druidawn a try? There is no long term obligation if the creative writing club doesn't work out for your child, and you never know... it may just turn your non-writer into a passionate writer in no time! Email us for more details on this unique service. Guide to Getting Reluctant Kids to Write by Miriam Darnell. Here are some curriculum ideas using Legends of Druidawn.